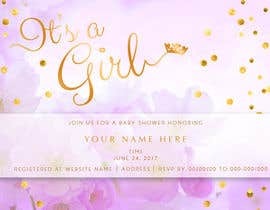 I would like to have a very professional, glamorous and girly baby shower invitation designed for my baby girl that is on the way. -The baby shower theme will be high-end and should incorporate glitz and glamour, princess and/or couture oriented designs. 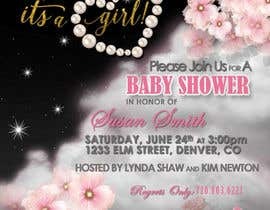 -The Baby Shower will be held on June 24, 2017 and will have a large number of attendees so the design and visual appeal of the invitation is very important. Please no cheesy baby drawings, bottles, or safety pins in the design. -Color theme for the baby shower will include shades of pink, White, Gold and possibly lavender. 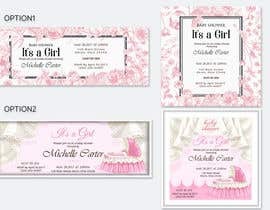 -The baby shower invitation orientation can be either vertical or horizontal and should be provided in .jpg, .ai, .png, .pdf, and photoshop editable format. I am looking for eyecatching design that will help bring together the theme of the baby shower and be feminine in nature. Good luck and happy designing... I am adding in a few pics of things that will be included in the baby shower for inspiration. hi please notice my #entry9 thanks. hope you like it! Please submit samples of all items requested in one entry. Also, I noticed several included the sample pictures I included specifically for inspriration, not for use in the invitations themselves, they are only provided to give an idea of the style plans for the event.